Um, apparently not Junius Heights either…. And East Dallas has never looked back. UPDATE: Having determined where the houses in these postcards were actually located — on Junius between Peak & Carroll — I now see this ISN’T Junius Heights! It’s a few blocks west of the Henderson Avenue boundary. So, not Junius Heights, but Junius Heights-adjacent! The postcard at top shows the Thomas Field house (built in 1884 and sold to John B. Wilson — of Wilson Building fame — in 1894); it was situated in a full city block bounded by Junius, Carroll, Gaston, and Peak. Before addresses changed throughout the city in 1911, the residence seems to have had no official address; in 1911 it was assigned the address of 4305 Junius. 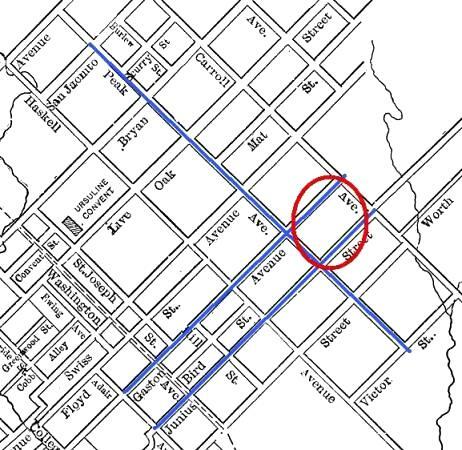 According to William L. McDonald’s book Dallas Rediscovered, the house was demolished in 1922 in order to subdivide and redevelop the property, Below is a map of the area from about 1898, showing the general location of the property. 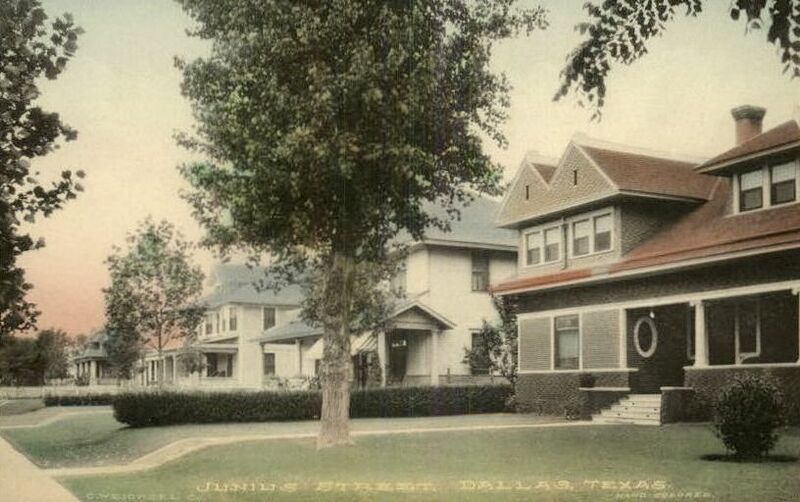 The second postcard reproduces a photo seen in a real estate ad from 1906 which shows “portions of Junius Street between Peak and Carroll” — so, in the same block as the Field/Wilson house. Just not actually in Junius Heights! Quote is from a history of the Junius Heights neighborhood on the Preservation Dallas site, here. My grandfather’s Aunt Julia left behind rural north Texas and moved to Dallas with her younger daughters some time about 1914. The reason I’ve heard cited for her move was the improved educational opportunities that the city would afford. Also, compared to rural Texas of the time, the ability to go downtown anytime you wished–rather than when the roads would let you–was a strong consideration. But life in the city offered other, less well defined, perquisites. Not the least of these was having a unique street address, which I can affirm Aunt Julia’s grand nieces and nephews could recite from memory over sixty years later. Just as Judy Garland had her 5135 Kensington Avenue in St. Louis, Aunt Julia was forevermore–well, almost–identified with 5208 Junius Street. Funny the things we remember. Do you have any idea where that house is in Junius Heights? I don’t recognize it. 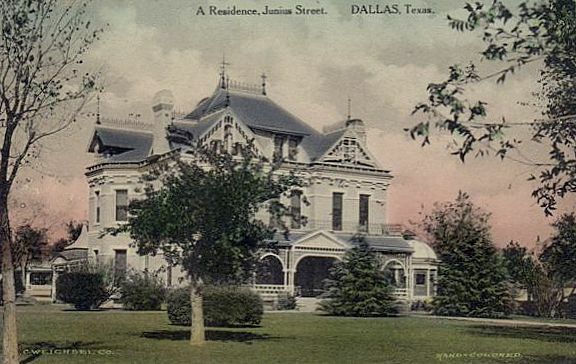 Perhaps it was demolished, like so many other beautiful old buildings in Dallas. Christina, thanks for your question, because when looking into finding out where the top house had been, I’ve just discovered that the houses seen in these postcards aren’t from Junius Heights afterall! They were on Junius Street, just not in the Heights neighborhood. These are older houses, a few blocks to the west. The top house was built in 1884 and has been demolished. I’ve updated the post to give some background and correct my mistake. Thanks again — I need to do a REAL Junius Heights post now! Thanks for finding this out, Paula. I’ve always wondered why Dallas doesn’t have the magnificent Victorians and Queen Annes of of its neighbors (McKinney, Gainesville, and Waxahachie come to mind). It seems they were all destroyed some time ago. Too bad! That Thomas Field house was a gem. Dallas used to have so many beautiful houses. I highly recommend William McDonald’s book Dallas Rediscovered. I’ve ordered it and can’t wait to read it! It may be the best photographic book on Dallas that there is. I suggest that before you open it up you grab a box of Kleenex and take your blood pressure medication, because you will be incredibly saddened (and angered) to see how many incredible houses and buildings we’ve lost. I can only imagine. And some of them were destroyed only a half of a century after they were built! So incredibly short-sighted. My husband is from St. Louis, and his family is very involved in preservation work there. We stumbled upon your blog last week and love it! It’s nice to meet a Dallasite who knows (and cares about) her city’s history.